Throughout this whole investigation into the Licata family murders, we have been hindered (right from the start) by an incredible lack of documentable evidence. And unfortunately, (the case is almost 100 years old now), time is now working against us as most of the evidence has long ago either been lost or (if like the author you believe in the conspiracy) deliberately destroyed. -------- Now granted, it has been a long time and records do (by natural occurrence) disappear, got lost or simply get thrown out. A good example of this can be found in Rosalind E. Murray’s book, “First But Not Last -The beginnings of Psychiatry in Tampa p4”, where it is stated that much of Dr. H. Madison Smiths papers (the psychiatrist who worked on the Victor Licata case), photographs, correspondences, etc., which had been donated to St. Joseph’s Hospital were found at a later time to have been “devoured or shredded by rats." Granted it was stupid for the hospital staff to have put them in a box where the rats could have gotten to them, but still, stuff like that does happens. HOWEVER here we must ask ourselves; So many records missing? By so many different governmental agencies? This should raise a few eyebrows somewhere. Lab reports (did Victor have any blood under his fingernails etc. ), dealing with the Licata Case. Evidence Locker holdings, such as clothes, underwear (which some say contained blood), etc. Written witness statements, and other forms of documentation. Physical evidence of any kind from the crime scene. Coroner’s Office (Tampa Area) – We were told that even if a coroner’s examination had been made, they simply did not keep them that far back and that there was no archival system set up that far back. Sheriff’s Department (Hillsborough County) - We were told that they did not have any Jail Records related to Victor Licata’s incarceration. In addition that they did not have or know of any other documents related to the case. Tampa Municipal Hospital (now known as Tampa General Hospital) – No records (medical or otherwise) related to Philip Licata (age 14), who was taken to the hospital on Oct 18, 1933 are known to still be in existence. Thus we will never know if little Philip ever said anything about those who had killed his family before he died. District Attorney’s Office -- No records of the case could be found. They claim that it just happened too far back and as there was never an actual trial, no trial transcripts would be in existence either. Italian Embassy – Would not comment on anything that happened that far back. 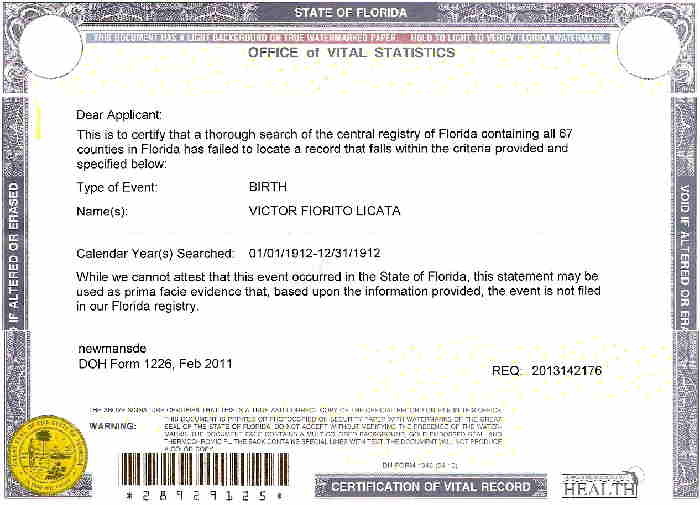 Bureau of Vital Records (Florida State) - No Birth Certificates seems to exist for either Victor or any other member of the Licata Family. They did however provide us with a certificate that they could not find Victors Birth certificate for the search year of 1912. STATE OF FLORIDA Narcotics Police Files – Records related to the Victor Licata affair. Chattahoochee State Hospital -- While they did provide us with copies of their old index cards (used to keep track of the actual records) and these index cards have been of great help. We were told that ALL the actual medical records had been transferred to the State Archives, which claims it can’t find them. State (Fla.) Archival Library -- Could NOT locate any of Victor’s Medical records, nor documents showing his exact birth-date. However, they did have information relating to his funeral records. Railforth Prison (where Victor was said to have committed suicide) - We were told that they did NOT think that they had any autopsy reports that went that far back. And that the only way to make sure was to do (an about) six hundred dollar search via old archival boxes, but there at Railforth as well as the archival library located in Tallahassee. Local (Railforth area) Coroner’s Office - All told us the same story, that their autopsy reports, simply do not go back that far. Chattahoochee State Hospital -- Knew nothing about the matter. Tampa, A.S.P.C.A. -- Seeking information about the Dog shown in the Inside Detective Magazine - no one knows anything about nor any way of tracking down a dog that far back. But here it should be stated that at least they had an excuse as it is our opinion that the dog itself never existed. St. Joseph Hospital - Private Mental records via Dr. H. Madison Smith’s office - They were eaten by rats. One wishes that this was a joke, but literally according to Rosalind E. Murray’s book, “First But Not Last ;The beginnings of Psychiatry in Tampa p4”, much of Dr. H. Madison Smiths papers, photographs, correspondences, etc. which had been donated to St. Joseph’s Hospital (in Tampa) had been “devoured or shredded” by rats. Funeral Home records relating to the Licata murders. According to the Tampa Times (Oct. 17, 1933 p1), while Phillip Licata was being taken to the Hospital: --- “Bodies of the killer's victims were removed to the J.L. Reed & Son morgue. There they were viewed by officers.” However, we were told that the records kept during that era were not very informative. Thus we were not able to find out very much. Example; what kind of clothes (night gowns or regular street clothes) the Licata’s were wearing. Photo’s of the bodies which might indicate some other source of death. [NOTE; the Police did not seem to do any of this and allowed the removal of the bodies so fast that even they had to go and look at them in the funeral home. However, none of these seems to have shown up via the funeral home records. Living Relatives of those involved – While some were polite, no one wanted to help out too much. About the only information gleaned was the fact that there was no Licata Dog. And in addition to the above . . . who knows how many other groups and individuals have been contacted by this museum; ALL with little or no results. By and large, the paper work trail needed to conclusively prove Victor’s innocence, has either been lost or was non existent in the first place. But this factor, of and by itself, should raise the eyebrows of more than one reader. How indeed was it possible for so many records, of such a high profile case, from so many different governmental agencies to have gone missing? Or worse still, to have never existed. As an example; how old was Victor Licata at the time? What was his exact birth date? As the answers to those questions would have determined whether Victor was to be treated as a juvenile or as an adult in court (see chapter 12) they would obviously have been of some importance. Yet, no official document that we have been able to obtain seems to show his exact age. Something that to anyone (believer of a conspiracy or not) should raise some red flag’s somewhere. Could this have happen through happenstance, a series of accidental coincidences? Possible, but I for one doubt that. Accidents of this scale just don’t happen. Once more, throughout this whole investigation into the Licata family murders, we have been hindered by an incredible lack of documentary evidence. What few documents we have been able to obtain (for the most part) lack the needed information to be of much use. And those few documents that have been of use seem to have come to us via bureaucratic bumbles. It appears that whoever was in charge of the cover up simply forgot or did not know that those documents existed. Museum Note – It is still possible to NOT believe that there was a conspiracy that framed Victor Licata. However, we feel that this book has already proven that THERE WAS A CONSPIRACY to at least silence or cover up many of the facts dealing with the case almost immediately thereafter. Thus we will make reference to a conspiracy from here after in this book in the past tense. Although we have already gone over them at some length in other chapters, perhaps at this point, it would be best to go over those documents that we have been able to find. As we go along, let us ask ourselves – why were these documents NOT also destroyed? Various Newspaper Articles: These have proven to have been vital in contracting many of the lies told by the Narcotics Police. And for obvious reasons the conspirators could do little or nothing about their circulation. Various Crime Scene Photographs – All of these were published in the various local newspapers – And at least one of them disproves or brings into question the whole story as told by the Tampa Police. A Photograph of a Dog - No one knows where it came from, but it did make it's way into the Inside Detective magazine article about the Licata case. Tampa Police (Official Crime Scene) Report – While the conspirators were able to eliminate all the other evidence (crime scene photo’s, lab reports, evidence locker holdings, fake confessions, etc. ), it seems that it would have been too suspicious (or obvious) had they also removed the Crime scene report. Besides, it doesn’t really have any incriminating evidence against them anyway. Final Lunacy commission Report: - We have been able to obtain a copy of the initial petition, BUT not of the finial commission report (which would have proven so incriminating to the conspirators). Fortunately for us, we have been able to locate a newspaper article (found in the Tampa Times Nov 2, 1933p5) – “Alienist Says Licata Insane”, detailing the final commissions report. Tampa Inheritance Estate Records - These papers seem to extend for over a 25 year period of time. One thing that they show is that Mike Licata was no poor individual. Inside Detective Magazine - the Article “Marihuana Maniac” is now considered a classic on the subject. Granted it is a work of shear fiction and conspiratorial lies, but still a classic first hand account. Florida State Bureau of Vital Records – We were able to obtain an official certificate showing that they were not able to locate Victor Licata’s Birth Certificate during the year 1912 (which would show that he was NOT 21 years of age at the time of the murders. However we were also told they weren’t able to locate any birth certificates for the Licata Family in general. Chattahoochee State Hospital -- While ALL of Victor’s medical records had been transferred to the State Archives, (which claims it can’t find them), they were able to provide us with the Index Cards that were used to keep track of the records. They did contain some useful information such as the fact that Victor weighed only 112 pounds when brought into the hospital in 1933. State (Fla.) Archival Library -- While they could NOT locate Victor’s Medical records, they were able to provide us with copies of his initial 1933 lunacy petition. Also a copy of the Funeral Home records (Lord & Fernandez Funeral home Inc. The above documents constitute ALL existing documents relating to the Victor Licata case that we have been able to locate. This does not mean that there are not others in existence, which have either been misfiled, OR for which we simply did not have the foresight to ask for. However, all in all, this author fears that this will be all the evidence that we will be allowed to obtain. Which is to say ALL of the documents that the conspirators either over looked, or were simply NOT able to destroy. -- That there was a serial Axe murderer operating in the Tampa area at the time? -- That the Licata family was NOT the only Tampa family cut down by an Axe murderer? -- That one of the other families slain by the serial Axe murderer was the Rowell Family --same last name as Earl Rowell - author of -- On the Trail of Marihuana, the Weed of Madness”? -- That Victor Licata (to his dying day) DENIED that he had ever used Marihuana? And that there was never a scratch of evidence to even suggest that he ever had? -- That much of the (alleged) evidence against Victor Licata was fabricated and so fake it wouldn’t have stood the light of day in a courtroom? To this we must ask: --- Why did such eminent figures and leaders of their community (including the District Attorney J. Rex Farrior, Tampa PD Chief detective Chief W.D. Bush and State Narcotic Inspector Frank S. Castor), remain QUIET AS THE LAMBS about the truth during the Reefer Madness hysteria campaign, in which the Licata case figured so prominently. Had just one of them held a small press conference stating what the real facts were, we today might not have the anti-Medical Marihuana laws in place. However, as history has shown, --- that was not to be. In fact one of the above individuals (W.D. Bush) not only kept quite, but it seems that he deliberately took part in the dis-information campaign. We started this chapter by stating that throughout this book, we have been hindered greatly by the shear lack of existing evidence. Even when it is in plain sight we still have been hindered. Example, a volunteer who lives in Tampa, was chased out of an unnamed cemetery (by security) before being able to take a picture of the headstone etc. And in other cases, we have been denied access to various documents due to privacy concerns. Wish that I was a family member, but alas that is not the case. [Museum Note: I am sure that this is not part of the conspiracy which took place so long ago, but simply a good hearted effort to maintain family confidentiality.] Thus much evidence has yet again been denied us. [18A]— Here (see chapter 14) it is possible that the report was made orally in a court room and thus no actual report exists.